Who? 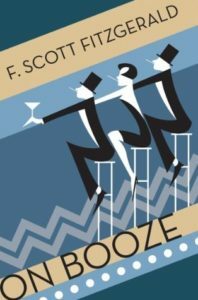 F. Scott Fitzgerald, key voice of the Roaring Twenties, lifelong alcoholic. What? A short posthumous collection of booze-fueled writing, the necessity of which (though mostly a joy) is ambiguous. When? Compiled in 2011 by Picador, with pieces from 1931-1945. How? Vignettes, aphorisms, witticisms, prose poems, letters. His flair, though here particularly scatty and unfocused, remains his absolute strength. Why? Nothing has spoken to me with more directness recently than the centre-piece of this collection, Fitzgerald’s The Crack-Up. What alcohol meant to Fitzgerald, how it informed his life and philosophy, is of secondary importance. Booze, in fact, is only a minor character in this entire compilation. At the forefront is Fitzgerald the vulnerable, Fitzgerald the abstract, the same Fitzgerald that remained unsure of action and consequence, and that could never cover up his self-doubt. Why have I, for the past month, struggled to get through the shortest and simplest prose? The relationship between alcohol and self-doubt is as complex as Fitzgerald’s dazzling imagery. But why probe any deeper? Perhaps Hemingway’s aphorism ‘Write drunk, edit sober’ is as meaningless as it first appears. On Booze is available as a Picador paperback.